ALAN FLETCHER was among Britain’s most inspiring graphic designers and visual thinkers. Fusing modernist clarity with an irreverent pop spirit, he played an important part in modernising the visual landscape of late 20th-century Britain by designing visual identities for the Victoria & Albert Museum, the Institute of Directors and Lloyd’s of London, and books for Penguin and Phaidon. During the 1960s Fletcher was a pioneer of the modern British design industry, and in the early 1970s he co-founded Pentagram, now one of the world’s leading design consultancies. Believing that design “encompasses everything”, he encouraged others to share his pleasure in the visual aspects of life in his bestselling books, The Art of Looking Sideways and Beware Wet Paint, which are packed with doodles, quotes, pictograms and wry observations. Born in 1931 in Nairobi, Fletcher moved to Britain at the age of 5, when his civil servant father was found to have a terminal illness. He lived with his mother and grandparents in West London until 1939, when he was evacuated to Christ’s Hospital boarding school in Horsham, Sussex. Rejecting its stuffy values, Fletcher enrolled at art school in 1949. He studied at Central School of Art and then the Royal College of Art in the early 1950s. He forged lifelong friendships with the designers Colin Forbes, Derek Birdsall and Ken Garland at Central, and with the artists Peter Blake and Joe Tilson at the RCA. After cheekily persuading the RCA to create a scholarship to Yale University for him, he married his Italian girlfriend, Paola Biagi, and set off for the US in 1956. There Fletcher felt liberated from the dreariness of classridden Britain. His teachers at Yale included the artist Josef Albers, and the eminent graphic designer Paul Rand, whose ambition, discipline and ingenuity became Fletcher’s touchstones. Throughout his career, Fletcher’s charm would prove almost as useful as his talent. He befriended US designers such as Robert Brownjohn and Bob Gill, as well as landing a coveted commission to design a Fortune magazine cover, and an assistantship with the renowned film title designer Saul Bass. He would have happily stayed in the US, but Paola coaxed him back to London in 1959. Fletcher camped in Forbes’s studio, and presented his portfolio of colourful US projects to prospective clients. Most British graphic designers — or commercial artists — were still working in black and white. Determined to match the creative and commercial ambition of their US peers, Fletcher and Forbes joined forces with Bob Gill in 1962 to form Fletcher/Forbes/Gill. They won commissions from the few British companies interested in imaginative graphics, such as BP, Cunard and Penguin. The Fletchers bought a derelict mews house in what was then grungy Notting Hill, where they brought up their daughter Raffaella. Photographed by Vogue in their studio, Fletcher/Forbes/Gill became the role model of a modern design company. Eager to raise creative standards in British design, the trio helped to organise the first Design & Art Direction exhibition in 1963 to showcase recent work. They celebrated the graphic design projects that inspired them, historic and contemporary, in the 1964 book, A Visual Comparison. witty synthesis of words and imagery. Typical was the 1965 Reuters logo that spelt out the company’s name in 84 dots of the tickertape machines that printed its news bulletins. 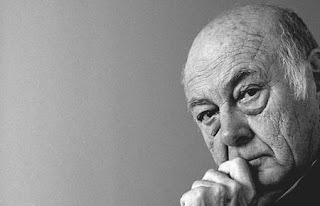 As new designers joined, the business expanded, and in 1972 Fletcher co-founded Pentagram as a multidisciplinary partnership with Forbes, Theo Crosby, Kenneth Grange and Mervyn Kurlansky. He was able to take on more ambitious projects — or “jobs” as he always called them — for Lloyd’s of London, the Institute of Directors, ABB, Lucas Industries and the V&A. By 1992 Fletcher wanted to work more flexibly and left Pentagram. He and Paola had already expanded their home into a neighbouring mews house, and when another came up for sale, Fletcher converted it into a studio, and worked there, assisted by Raffaella and Sarah Copplestone. For the rest of his life he was free to choose the jobs he enjoyed, notably at Phaidon, the art book publisher, where Fletcher worked with the visual imagery he loved. Much of his time was devoted to personal projects: hundreds of beautifully executed pictograms, architectural drawings, flower paintings, and humorous collages of letters, fruit stickers and wine labels. To Fletcher, work and life were inseparable, and to be enjoyed to the full. “Design is not a thing you do,” he said. “It’s a way of life.” This was the underlying philosophy of The Art of Looking Sideways and Beware Wet Paint. Believing that most people are not taught how to look properly, Fletcher helped them to do so by filling his books with anecdotes and practical tips, such as sitting backwards in trains to enjoy the view. This philosophy was embodied in the Fletchers’ home, which was filled with his artwork, the strange objects he collected and junk sculptures made to entertain his grandson Tobia. He built a spiral staircase and most of the kitchen from salvaged scrap. To amuse passers-by, Fletcher designed iron gates forged in the elongated letters of the alphabet. A vintage Mini Moke was parked outside, ill-suited to London weather but ideal for the sun-loving Fletchers. With friends all over the world, he and Paola loved to travel, and to entertain at home. Fletcher sketched pictorial diaries of meals with friends, many raising glasses of his favourite prosecco, and of travelling with his family. Fletcher once said that he hoped “to get younger as I get older”, and succeeded. Intellectually open and insatiably curious, he was the antithesis of a grumpy old man, and befriended many younger designers. Fletcher, winning numerous awards, was an exemplary designer, who remained true to his personal vision and combined commercial success with the highest standards of creativity. Through his books, he enriched the lives of many people by enabling them to share his joy of looking at the world.